Eye allergies develop when the body’s immune system becomes sensitised and overreacts to something in the environment that typically causes no problem in most people. The most well-known eye allergies are seasonal and perennial allergic conjunctivitis, they are however not the only types of eye allergies. 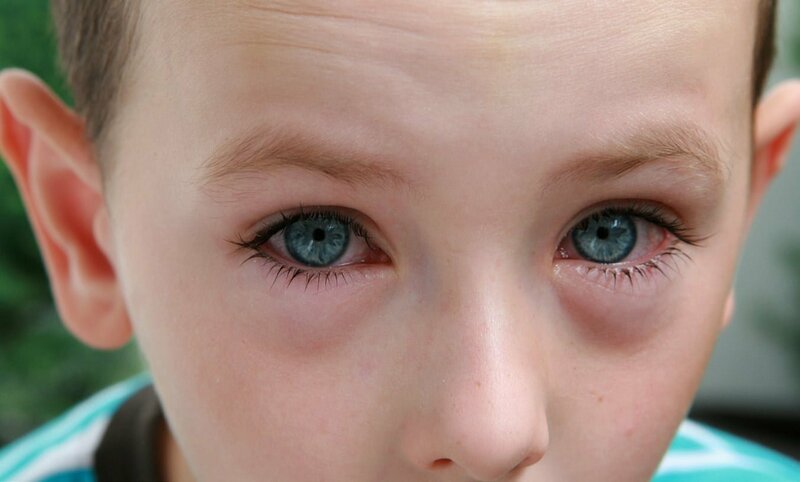 An allergic reaction can occur when an allergen comes in contact with antibodies attached to the mast cells in your eyes; the cells respond by releasing histamine and other substances or chemicals that cause tiny blood vessels to leak and the eyes to become itchy, red, and watery. Eye allergies share symptoms with some diseases of the eye, making accurate diagnosis imperative. The symptoms of eye allergy can range from mildly annoying redness to inflammation severe enough to impair vision. Symptoms can occur independently but usually accompany the sneezing, sniffling, or stuffy nose related to nasal allergies. The primary types of eye allergy are seasonal or perennial allergic conjunctivitis, vernal keratoconjunctivitis, atopic keratoconjunctivitis, contact allergic conjunctivitis, and giant papillary conjunctivitis. People with SAC may have chronic dark circles (known as allergic shiners) under their eyes. The eyelids may be puffy, and bright lights may be bothersome. SAC symptoms often accompany the runny nose, sneezing and nasal congestion associated with hay fever and other seasonal allergies. The itching may be so bothersome that patients rub their eyes frequently, making symptoms worse and potentially causing infection. Perennial allergic conjunctivitis (PAC), as its name implies, occurs year-round. Symptoms are the same as with SAC, but tend to be milder. They are caused by reactions to dust mites, mould, pet dander, or other household allergens, rather than pollen. If left untreated, vernal keratoconjunctivitis can impair vision. If left untreated, atopic keratoconjunctivitis can result in scarring of the cornea and its delicate membrane. If a patient’s symptoms persist or over-the-counter remedies do not bring relief, advise them to see an allergist, who will review their medical history and symptoms and conduct tests that can reveal an eye allergy.